At a time when the food of tomorrow becomes one of the main topics discussed by the agricultural authorities, we see growing on the roofs of buildings of major cities invaded by concrete, various plantations dedicated to feeding the inhabitants of the city. Prestige met in Montreal Nadine Lahoud, a Lebanese woman who is completely devoted to urban agriculture in Paris where she implemented organic cultivating project on the roofs of Paris. A challenge that she launched and has successfully met. Meeting with a fighter with an irresistible intelligence, culture and passion for life. Who is Nadine Lahoud? After a happy childhood in Lebanon, my family was forced to leave during the war like many Lebanese. We used to spend the summer holidays in Beiteddine, the family birthplace, where I could see myself farmer. Until the day I attended, crying, to the sale of our plots. In fact I was crying on my dream. From a French mother, we naturally chose France for us to install. This passion that sprouted in Lebanon finally hatched in Paris. In 2010 I founded my own company, Veni Verdi, a non-profit organization whose purpose is to develop urban gardens. Where do you find available spaces in Paris for your plantings? In Paris, the available surfaces are roofs par excellence. Veni Verdi is a new way to realize my childhood dream and act on modern ills we suffer, the dream of putting more and more gardens, including on the roofs of Paris, whatever their forms: social gardens, family gardens, school gardens or just urban agriculture projects. The gardener in the past was the one who was gardening to produce food for his village. With the Green Revolution, the gardener has been categorized, he specialized in vegetable, in farmer. To run our projects, we talk to donors who are willing to offer us their roofs. What kind of plantations attracts you? Social and participatory agriculture in particular, that respects the environment and nature, that does not use chemicals, which relies on the forces of nature. One that appeals to all. I invite each of us to give of his time to help produce, together we are more effective and accountable. I work to get people to be interested by the earth, we are all equal before it. I help them choose between farming or floral projects, the majority chose the vegetable garden. 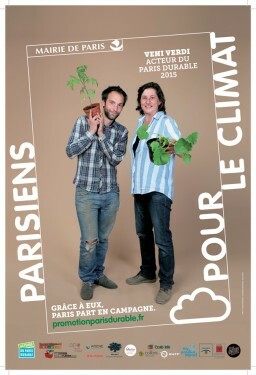 I plant on the roofs of Paris all kinds of vegetables or fruit. The word vegetable is a culinary word created to distinguish the salty from the sweet. All vegetables are fruits. There are three food categories: the leaves like lettuce, endive, parsley…, roots like potatoes, carrots and fruits that can encompass everything, and that are result of the flower that has turned into fruit. The fig is the only exception, since it is a flower does not pass through the fruit stage. This is a huge project, are you assisted? We work as a team, employees and volunteers. Note, however, that young people find great pleasure to come gardening with us, we offer them a space of freedom where they can observe, craft, plant, sow and harvest … And I have the same pleasure to teach them to love Earth. Secondly, we are supported by our town hall of the 20th, and by the city of Paris who gave us the trophy of the Social Solidarity Economy (ESS) and making us the winners of sustainable Paris Promotion. The City of Paris is committed to improving the environment, preservation of biodiversity, the promotion of social solidarity economy, it opens sites to install our urban agriculture projects. Since when does this urban agriculture exist? 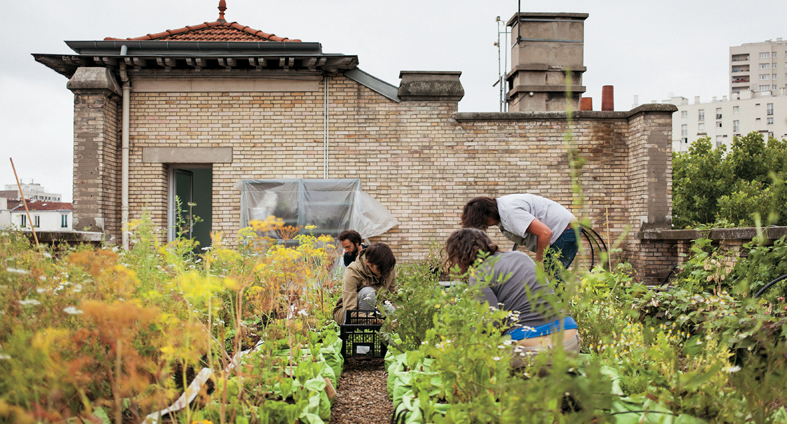 All that grows on buildings is urban agriculture. The Gardens of Babylon are a good example. The Aztecs also including the nobles among the population, were growing their plants on their roofs. In our Lebanese mountains, many roofs covered with vines or other plants. Urban agriculture has always existed. We must reintroduce in cities. It’s time we take care of ourselves, to produce our own food while respecting the rhythms of nature. Nowadays, we are increasingly wary about the food produced by the agricultural system, the farmer is trapped, he is in a hellish situation, forced to buy seeds at high prices, sell at fixed prices by distribution. Quote us some vegetables or fruits you grow on rooftops. Our projects span on a planted area of ​​6.500m2, divided into three sites, • the roof of ERDF, (Electricity of France) where we grow our tomatoes, peppers, squash, leeks, cucumbers … • College Pierre Mendes France where we grow artichokes, asparagus, raspberries, kiwis … • College Henri Matisse where we grow all kinds of herbs. We occupy greenhouses of College Segpa Edouard Pailleron specialized for students ready to become professionals. All our plants are produced by them. We also produce honey. Indeed to pollinate plants we have chosen to install hives for bees gather pollen that come to give us the best 100% organic honey. I should say that on the roof of the Opera there are since a long time beehives and on the rooftops of Galeries Lafayette, we grow strawberries. Producing to eat is not trivial, it is the responsibility of everybody, this requires helping the farmer, happy to produce healthy vegetables. If the consumer gets used to buy fruits and vegetables at their local farmer near his home, he can change the world. I think we have created a large industrial machine that has as main objective the profit, forgetting its original mission: to nourish, nurture healthy. In general the prices of organic products are more expensive, what about yours? Our prices are affordable to the greatest number. Ultra fresh, ultra local, picked the day and on your plate the same day, which could be better? Who are your customers? I prefer to name them actors. They invest in the development of projects. The first actors are individuals, citizens, such as the staff of ERDF that comes to get supplied from us to enjoy the foods picked on the same day, or volunteers involved in our daily lives. For social landlords who have many estates and seek to improve the social environment of cities, it seems that the garden is a good answer. Institutional actors, such as the town hall of Paris, the Ile de France region, wish to promote all actions that improve the social, urban and above all promote biodiversity. What is the reason for your presence in Canada? I came to Montreal to get inspired by the techniques used to develop them in Paris. Montreal has already taken innovative projects, be it social or environmental projects. It was in Montreal was born the first commercial greenhouse operating in the world. What advice would you give to Lebanese consumers? Grow your vegetables and fruits, you no longer will depend on others and better off you will be, you and your children. Teach them how to garden, to harvest and eat their own work. Being in touch with the earth teaches us to love and respect life, for me it is the best school. Students often come to help me, they participate, I wish that in the future it is them who will be in charge of the projects, I want them to change the world. What are the cities in your opinion that practice this type of agriculture? Major cities of the world like Paris, New York, Portland, among others, are interested in urban agriculture with 70% of the population will live in cities by 2050. The campaign no longer satisfy industrial agriculture that is practiced there, above the moral problems, impoverishment of the people attracted to the city with their modern comforts, access to technology, health, education and culture. What are your future plans? Having our own local and especially install more and more gardens closer to children as they are our future.